Inspired by L.A. street style, these dog tags are a little bit on the wild side. They are very casual, fun and urban--and have attitude. They have a raw edge to them that is sure to delight the hipster in you. 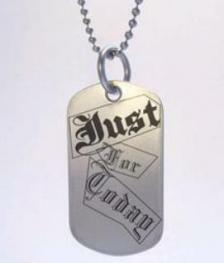 Military style dog tag necklaces are suitable for men and women even those who don't usually wear jewelry. Completely hand-etched in my workshop using a 19th century technique I rediscovered. Back of tag is customizable. Measurements: 1.1"W x 1.9"L x 0.03"T mounted on a 30" stainless steel ball chain that can be easily cut to your preferred length.